While the month of March is notorious for weather that "comes in like a lion," it is very special for St. Francis Food Pantries and Shelters and our clients. This is because it marks the kick-off of Macy's Bag Hunger, a national campaign that encourages the employees of Macy's to get involved and give back. Now celebrating its 17th year, this month-long initiative has raised the equivalent of 71 million pounds of food via food and dollar donations. Our organization is humbled to be the beneficiary of this campaign that raises vital resources for the thousands of individuals and families who depend on us each year. Three months after the Thanksgiving feast is typically celebrated, we hold "Thanksgiving in February," our first program event of 2014. Celebrity Volunteer Constantine Maroulis, American Idol finalist and Broadway star, was joined by corporate volunteers from Con Edison and Macy's for a memorable day of serving others. Our Annual St. Patrick's Day Luncheon took place a "wee bit" before St. Patrick's Day and was sponsored by Macy's. Varying shades of green, traditional cuisine and expressions of sheer enjoyment were visible as far as the eye could see! 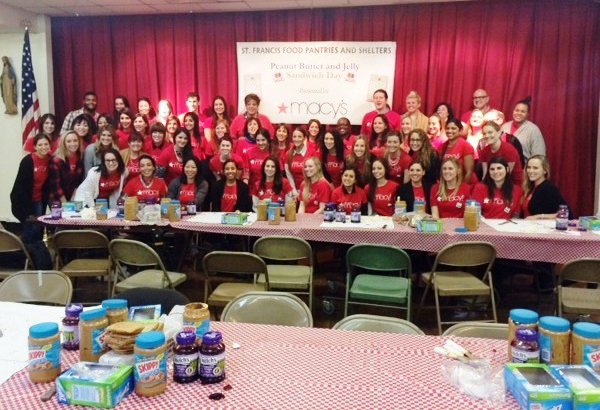 In general, employees of Macy's contribute immensely to our very popular Peanut Butter and Jelly Sandwich Making Days program. However this month, as part of their campaign to Bag Hunger, this was the case even more. Volunteers participated on two days out of the week, during every week in the month of March. That is A LOT of sandwiches! Many of our Community Programs like our Back to School Picnic, 1,000 Kids with Ernie and Holiday Give Back Party would not be possible without the help Macy's. These diverse events focus on nourishment, family and education because we believe that these core things should not be sacrificed, regardless of circumstances. Macy's consistently demonstrates that they are not only a leader in the retail and commerce space but also in the realm of philanthropy.